John Burger is a graduate of Brigham Young University, where he received a BA in Communications with an emphasis in Advertising. During the day he sells watches as the Online Marketing Director for Precision Time. At night he fights modern slavery as AbolitionistJB. In between he enjoys his time at home in Dallas, Texas, with his gorgeous wife, three little kiddos and two chickens. Chickens, that's where it's at these days. His eternal church calling is with the Young Men and he still dreams of dunking a basketball. You can learn more about John's abolitionist work here or you can email him directly at abolitionistjb at gmail.com. Also, read John's first guest post here. I turn twenty-nine this summer. The closer I come to thirty, the more I realize there's not much spring in this chicken. 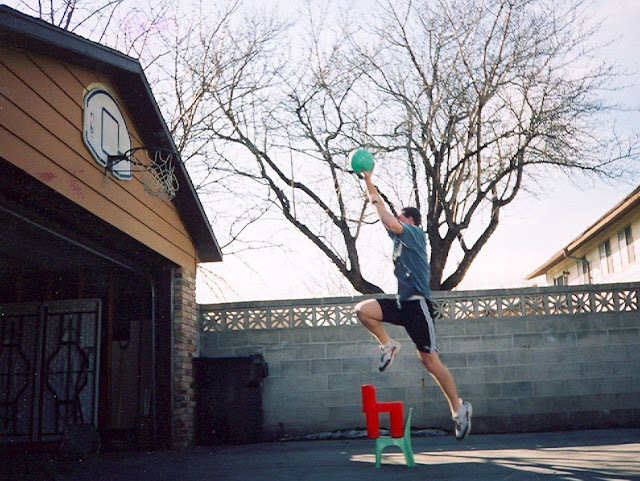 Since the age of sixteen I have had one constant New Year's resolution: dunk a basketball. With the first priesthood meeting of each year, it's inevitable that the lesson includes writing down some personal goals. Nowadays those goals read out something like this. Read the Book of Mormon, reread the General Conference talks, 100% home teaching, go to the temple each month, take my wife out on more dates, run 5K's, lose weight...and dunk a basketball. I have a B+ average on most of those goals, but dunking a basketball is a big "F" for failure. It has always eluded me. It's my "White Whale." There was a point between age eighteen and twenty-one where I could dunk my wallet, or a tennis ball. Usually it was the wallet because who really has a tennis ball handy at the gym. Here I am on my mission dunking over some kiddie chairs. Looks impressive, I know. But sadly the hoop was only 8 1/2 feet off the ground. I even broke the rim off the backboard with this dunk. It was something reminiscent of Shaq in his glory days. The land lady was a little upset, but she bought a new breakaway rim after that. She was such a nice lady. Recently a friend at church roped me into 6:00 a.m.-ish (emphasis on the -ish) basketball three days a week at our local rec center. It's been fun to play so often on a nice wood court, especially when contrasted to the mini-court with joint-tearing carpet floors at our ward building. Over the last three months I have shed 20 lbs. and my fingers can give the rim high-fives again. With my 29th-birthday fast approaching, I knew it was now or never to make my dunkfest goals come true. So this week I started a plyometric workout regime. It's nothing fancy, like from the $60 special dunk programs I found all over the web. These are basic jumping exercises that can be done at home. So, far all of you fellow pilgrims also on the quest for dunkhood, here is what I am doing to reach my goal. Complete this workout three days per week with at least one day of rest in-between. It takes about thirty minutes to complete. Include these workouts with your regular basketball play or other activities. Increase the reps each week according to your abilities. You want to feel the burn, but don't hurt yourself. Needless to say, pulled muscles hurt...a lot. My hope is that by maintaining this workout with weekly increased reps, I should be throwing it down and gnawing on that rim within four months. Just remember not to dunk in a stake basketball game. Chances are you will pick up a technical foul. Although, one technical might be worth it.